Also click here to read Bob`s article in JEC Magazine ! 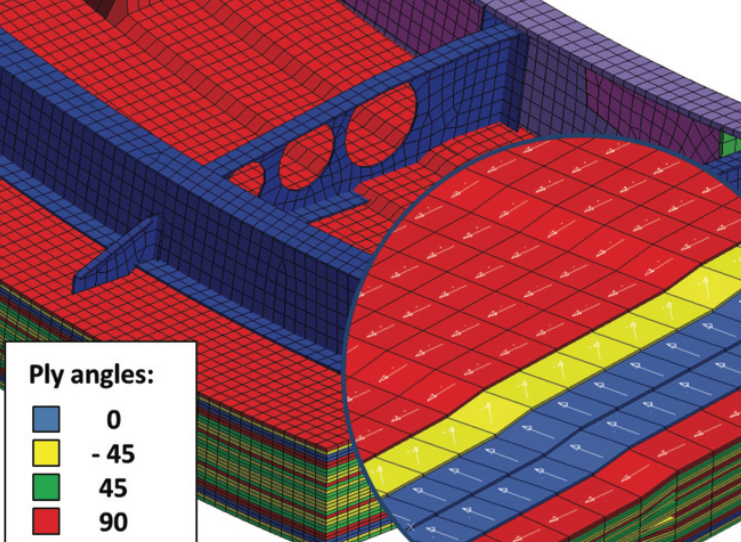 Dr. Robert Yancey, Vice President of Aerospace Solutions at Altair, recently published this article onAerospace & Defense Technology about the advantages and issues that arise when using simulation software on composite aircraft structures. Read the original article here. The introduction of composite aircraft structures has increased the reliance on computer simulation tools and methods in the Aerospace industry. However, the use has always been coupled with significant physical testing. Though there are any benefits in composites, aircraft designers have become wary of the potential difficulties. These difficulties can be managed with the latest simulation software. Composites have extremely high ratio of stiffness to weight. Carbon fibers combined with plastic glue-like matrix can create a very light, yet stiff material, which is capable of exceeding most metals and offer many advantages over conventional materials. Thus, by using composite materials, the aircraft can achieve a lighter and stronger body while saving fuel costs. Composites also have very attractive fatigue properties. Unlike metal structures, cracks in the matrix are quickly arrested by the fibers to prevent propagation. The fatigue performance can be controlled in order to prevent any risk to the structure by implementing various levels of material processing. The amount of force that must be exerted to produce cracks in structural composites is substantial, and much of the energy results in breaking the fiber-matrix bond instead of deforming the product. 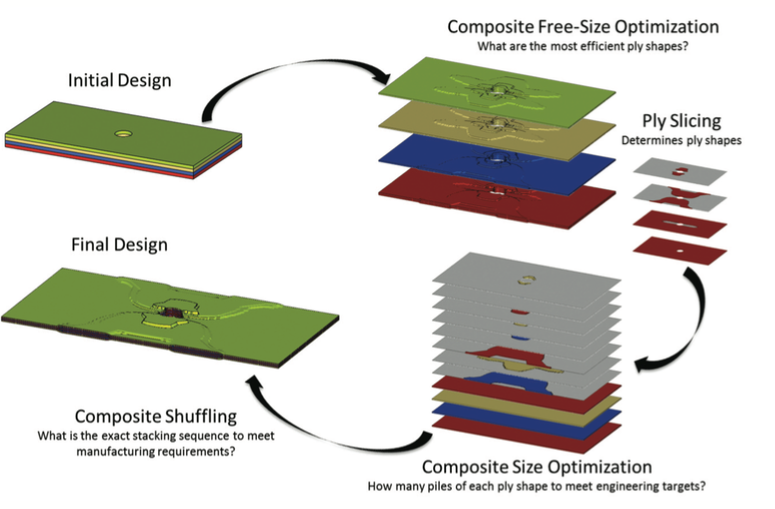 Composites give aircraft engineers design flexibility. 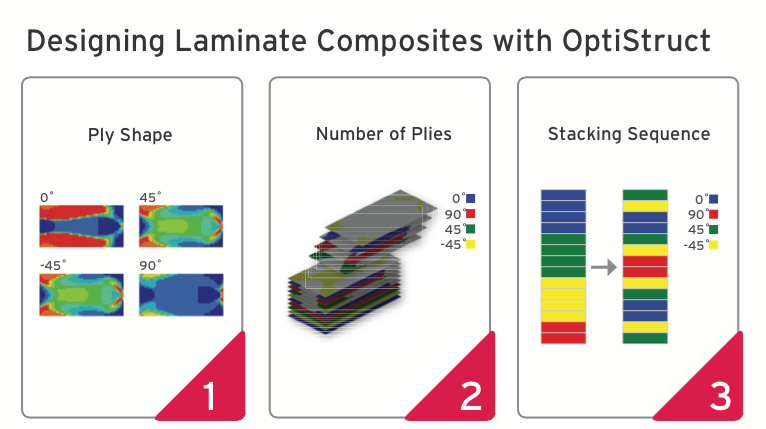 Composites are built from laminates in which unidirectional layers of fabric are stacked in a variety of orientations to provide maximum stiffness to a certain area in the structure. Therefore, engineers can tailor composites to change shape slightly when a load is applied. This characteristic enables the development of more aerodynamically efficient wings. A unique benefit of composite structures is the ability to embed sensors in the skin of the aircraft, which allows pilots to monitor any damage. The capacity to discover a small problem before it grows makes such sensors invaluable. A key benefit of composites is that they are inherently corrosion resistant. Since they do not contain metals, there is no galvanic corrosion of the material. Corrosion is a major issue in metal aircraft, requiring frequent inspection and tight control to avoid trapped moisture in the structure. Overtime, corrosion can cause metal to fail disastrously. By using composites, airframe inspection intervals are increased to save operators time and expense. Composite structures can make flying more comfortable and enjoyable for passengers. With a composite fuselage, pressurization and depressurization in the aircraft can be handled much more effectively than metals, which are subject to fatigue from these operations. Not only that, the humidity level can be set higher. Also, windows in a composite aircraft can become larger with the support of stiff material. Composite fuselage can result in less ear-popping, headaches and dry mouth after extensive flight times. While composites resolve many problems that are common to metal structures, they have issues of their own. Since they are built up from a number of ply layers, composites can delaminate between layers at their weakest points. Delamination is likely when loads are perpendicular to the layers or shear loads are applied. Similar to exerting pressure on a deck of cards, the stack may fly apart if pushed in the wrong direction. Internal load distributions can be extremely complex in composites, and in certain combinations of loads, layers can tend to separate. 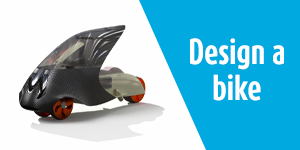 To meet the challenge of delamination and avoid buckling, composite-structure designers must confirm that the fibers are the strongest where the loads are applied on. Design engineers must consider all of the many potential load paths in the structure to reduce delamination. Therefore, computer simulation is becoming more critical to composite-aircraft design. Unlike metals, there is no way to inspect composites for weakness or internal damage. When delamination or cracks occur, they usually are internal, hidden inside the composite material where it cannot be seen. Embedded sensors help catch these faults, but they require an approach that is new to the aircraft industry – necessitating adjustments in processes. One of the most intractable problems surrounding composites becomes apparent when joining composite components to metal structures. Composites bear most of the load because they are the stiffer material, and manufacturers compensate for this increased stress by building up the composite-to-metal joint with more composite material, which increases weight. However, the metal expands and contracts at a different rate than the composite, which can lead to failure of the joint. This issue could be resolved by simply making more components from composites, creating an all-composite joint. However, this solution is not easy. Composites normally are joined with an adhesive layer that is prone to delamination. Two composite parts could be joined by fasteners, but that process introduces stress concentrations from drilled holes and the different expansion rates between the composite and the fastener. The ideal solution is to develop more comprehensive and integral composite structures, so that the joining of parts is avoided. Aircraft developers are making great progress in developing integral manufacturing methods. Engineers, designers, and manufacturers, who want to employ composites in aircraft, must consider and test a multitude of factors. They are relying on computer simulation more to help with evaluating all the variables that can affect composite structures. In other industries, simulation can be used to design and test composite structures before investing in an expensive build of the physical aircraft. 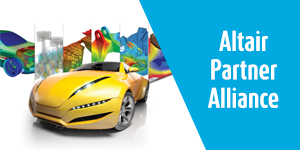 With composites, however, simulation becomes more complicated. 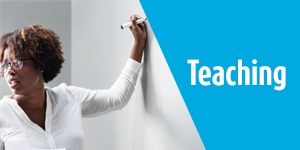 Composites are not uniform materials; they consist of layers of fibers with specific directionality that can impact the way the structure reacts. This heterogeneity exponentially increases the design variables. As a result, there are many emerging conservative aircraft designs that failed to fully capitalize on the valuable characteristics of composites. 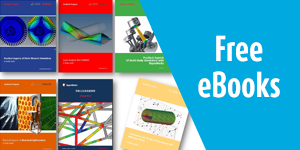 Today, engineers have reliable and systematic simulation software available to manage the burden of optimizing composite-based designs. It can calculate optimal number and location of plies, ply angles, and stacking of the plies. 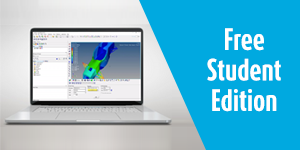 It can also evaluate hundreds of load cases simultaneously, consider innumerable variables, and automatically produce the calculations for the best composite structure. 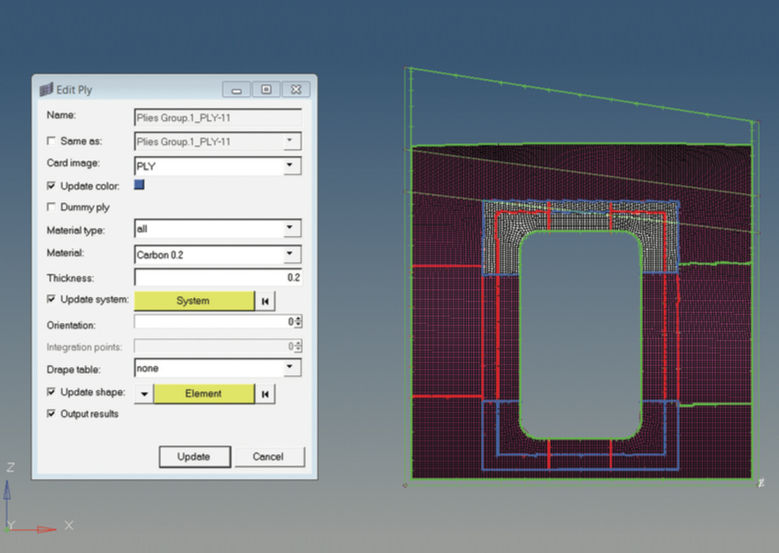 Engineers can now easily map composite ply shapes and parameters onto a simulation model and receive individual layers and total aggregation of layers results. The simulations provide great insights and solutions for the design and potential problems without using physical testing. Simulation is becoming a crucial process in the new-generation composite aircraft designs, producing safer, more comfortable and more fuel-efficient designs that are certain to boost the application of composites to more structures in the years ahead.